CHESTER–The planning and zoning commission has scheduled an August 5 public hearing on special permit applications for two projects that could boost economic development in town. The hearings convene at 7:30 p.m. at the Chester Meeting House on Liberty St.
An application from Airport Industrial Park LLC (owner), and Hull Management LLC (applicant) calls for a 50-foot by 50-foot steel building on a one-acre parcel at the Airport Industrial Park off Route 145. The company provides engineering development and prototype manufacturing for machine products that are sold to other companies. The site plan includes parking four to five employees and two to three visitors, and predicts “light to moderate” truck traffic for delivery and shipping of products and materials. A second special permit application seeks approval for a Bliss Supermarket in a vacant building at 56 Middlesex Avenue (Route 154) near the intersection of Route 154 and Main Street. The commercial parcel is owned by 56 Middlesex Avenue LLC, the applicant is John DeFrino. ESSEX–The recommended candidate for the zoning enforcement officer position has declined a job offer from the town, leading officials to repost a position that has been vacant since early May. At a special meeting Monday, the board of selectmen offered the job to Robert Flanagan, a Thomaston resident who currently works as zoning enforcement officer and other land use positions in the town of Redding. Flanagan, one of about a dozen applicants for the position, had been recommended by a selection committee that included members of the zoning and inland-wetlands commissions and Selectman Joel Marzi. Flanagan told the selectmen Monday that he would not mind the commute from his hometown, located just north of Waterbury, and was interested in working in Essex. The job offer for the 30-hours per week position, which also has duties as inland-wetlands enforcement officer, included an annual salary of $52,852 and other benefits provided to town employees. But Flanagan contacted Maria Lucarelli, administrative assistant to the board of selectmen, Thursday to report that he would not accept the job offer. Lucarelli said the town would probably repost the position, including another round of interviews by the selection committee, before a new finalist is recommended to the selectmen. The new ZEO would replace Marian Staye, a Deep River resident who had held the job for nearly eight years. Staye has continued to work one day per week as the zoning enforcement officer, and is expected to continue in the capacity while the search for a replacement continues. Gregory R. Shook, President & CEO of Essex Savings Bank, is pleased to announce that Ed Hazuka of Old Saybrook has been promoted to Vice President. 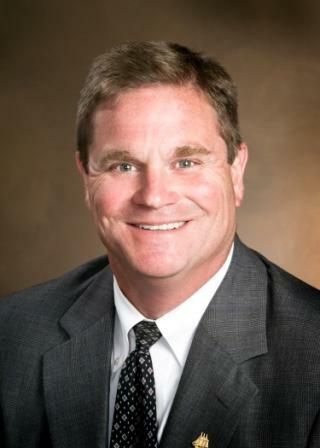 Ed joined Essex Savings Bank in May 2004 as the Bank’s AVP/Information Systems Officer and has twenty-five years of industry experience, computer programming skills, and overall information systems knowledge. Ed has managed the new information technology challenges and opportunities brought on by the ever-growing size and complexity of the Bank while directing the on-going bank information systems. In addition, he serves as the Bank Privacy Officer, Information Technology Officer, and is responsible for a number of policies that protect systems, customer information, and their potential effect on the Bank’s overall reputation risks. Essex Savings Bank is a FDIC insured, state chartered, mutual savings bank established in 1851. The Bank serves the Lower Connecticut River Valley and shoreline with offices in Essex (2), Old Saybrook, Old Lyme and in the fall Madison. Financial, estate, insurance and retirement planning are offered throughout the state by the Bank’s Trust Department and subsidiary Essex Financial Services, Inc. Member FINRA, SIPC. Investments in stocks, bonds, mutual funds and annuities are not FDIC insured, may lose value, are not a deposit, have no Bank guarantee and are not insured by any Federal Government Agency. One of the highlights of the current exhibition Connecticut Treasures: Works from Private Collections is no longer privately held. The painting – a magnificent view of mountain laurel by the American Impressionist Willard Metcalf (1858-1925) – recently became one of the most significant collection additions the Florence Griswold Museum has made in its history. It makes its debut in Connecticut Treasures as an example of how a work of art can, over generations, be held privately before entering a public collection like the Florence Griswold Museum. Willard Metcalf painted Kalmia (which he named after Kalmia latifolia, the botanical name for mountain laurel) in 1905 during his first summer staying at Florence Griswold’s boardinghouse as part of the Lyme Art Colony. Metcalf had only to walk just short distance from the Griswold property to capture on canvas this vista of the gentle Lieutenant River partially screened by a blossoming stand of mountain laurel along its banks. For a few years the painting was seen in various exhibitions in New York and elsewhere to much acclaim. 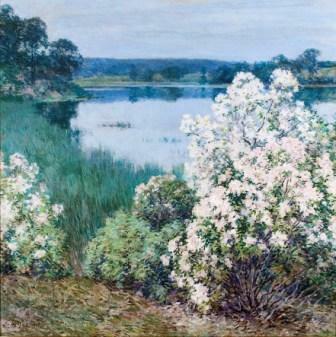 Critics instantly recognized the painting’s significance: “Willard Metcalf is at his best in Kalmia,” one wrote, “with its flowering bushes at the side of a stream, the delicacy of the pink and white blossoms being caught with tenderness and feeling, the result being a picture having much of the poetry of nature.” Perhaps inspired by this example, Metcalf’s artist contemporaries in Old Lyme made a practice of depicting mountain laurel. The flower not only became Connecticut’s state flower, but a key motif in American Impressionist paintings associated with Lyme. Kalmia was eventually sold in the 1930s to a private family, who held it for over seventy years, transferring it from one generation to the next. During this time, the painting remained largely unseen and forgotten by art historians until it was offered for sale to the Florence Griswold Museum. With the help of a consortium of generous supporters, the Museum is nearing completion of a campaign to raise sufficient funds to acquire Kalmia as part of the permanent collection. The painting joins what is today the largest public holding of Metcalf’s work, comprising oil paintings, pastels, drawings, and diaries representing each phase of the artist’s career, as well as Metcalf’s naturalist collection, a unique group of butterflies and bird eggs the artist gathered during his world travels. In commenting on this acquisition, the Museum’s director Jeffrey Andersen exclaimed: “What a find! Kalmia is a breathtakingly beautiful painting and without a doubt one of Metcalf’s most significant paintings from his years at the Lyme Art Colony. We are thrilled to have the opportunity to acquire this painting for the public to enjoy for years to come.” Andersen will be presenting a gallery lecture entitled “The Rediscovery of a Lost Masterpiece: The Story Behind the Acquisition of Willard Metcalf’s Kalmia” on Wednesday August 18th at 6:30 p.m. at the Florence Griswold Museum. The public is invited to attend this special program to learn more about this acquisition. Throughout the month of August, the Marshview Gallery in Old Saybrook will be displaying photographs by Jeff Hackett of Woodbridge. eighty books and calendars throughout the world. A reception will take place on August 13, from 5:00- 7:00 pm at The Estuary Council, 220 Main Street, Old Saybrook. Call 860-388-1611. 9 Town Transit now provides direct service to between Old Saybrook and New London with its new Southeast Shuttle. This service replaces the current Niantic route that terminates in Niantic. The Southeast Shuttle operates Monday through Friday from 7 a.m. until 5 p.m. between the Old Saybrook Train Station and the New London Transportation Center in downtown New London, via Old Lyme. Old Lyme stops include the A & P, Lyme Academy College of Fine Arts, Old Lyme center, Shore Rd., Ryewood and Lymewood senior housing, and the Lymes’ Senior Center. The cost of the service is $1.25 town per one way trip. The new service provides a fast and convenient link between Old Saybrook and New London in a 45 minute trip. Users from the Estuary region will also be able to connect for free to the Southeast Area Transit (SEAT) system at the New London Transportation Center for service throughout New London, Norwich, and other southeast Connecticut towns. Easy connections can be made to such points as the Crystal Mall in Waterford, Lawrence and Memorial Hospital, Connecticut College, Mystic, Foxwoods, and Mohegan Sun. The service also allows New London/Norwich area residents to travel throughout the Estuary region. Users will be able to connect for free to any 9 Town Transit service, with service to all nine Estuary region towns including such points Westbrook Tanger Outlets and Clinton Crossing Outlets. Transfers can also be made to Middletown, New Haven, and Hartford. The Estuary Transit District provides public transit service via the fleet of 13 buses to Chester, Clinton, Deep River, Essex, Killingworth, Lyme, Old Lyme, Old Saybrook and Westbrook through its 9 Town Transit service. Connections are provided to New Haven, Middletown, Hartford and New London/Norwich bus services as well as Shoreline East Commuter Rail. All services are open to the general public with no age or disability restrictions. 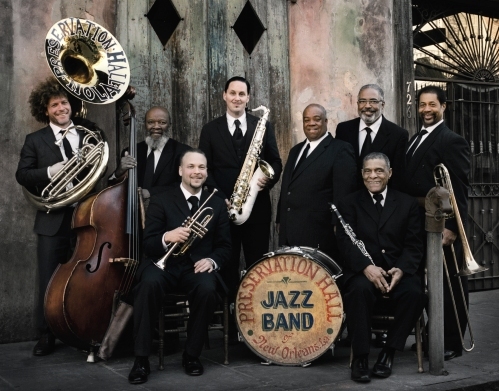 The legendary Preservation Hall Jazz Band headlines the Aug. 4 Bring Our Music Back concert at Harkness. Bring Our Music Back, Inc., in collaboration with Kitchings Productions, presents “August Nights at Harkness . . . Music the Way it Was.” The concerts at Harkness Memorial State Park in Waterford are scheduled for Wednesday, Aug. 4, with performances by the legendary Preservation Hall Jazz Band of New Orleans and Thursday, Aug. 12, with “the one and only Tommy Dorsey Orchestra”, under the direction of Buddy Morrow, the Gentleman’s King of Big Band Swing. On Aug. 4, Tosh Sheridan will open the concert from 6 to 6:45 p.m. and the Sugarfoot Youth Jazz Band (pictured above) will perform from 7 to 7:45 p.m. before the Preservation Hall Jazz Band comes on at 8 p.m. Both concerts are being held from 6 to 10 p.m. Doors open at 5:30 p.m. for traditional picnicking. The Bee and Thistle Inn of Old Lyme will sponsor the Best Picnic awards. The goal of “August Nights at Harkness” is to stage a community-involved event for the whole family to enjoy while picnicking in the park on a summers night. Both concerts open with a youth music performance. Bring Our Music Back, Inc is a pending non-profit 501c3 (application submitted 3/10) organization dedicated to the enrichment of life and healing through music in support of aspiring musicians, programs and services within our communities. The initiative of their concerts is to give burgeoning talent a voice and venue with national recording artists while providing a platform to raise funds to give back to music initiatives within the community. This is Music with Purpose. 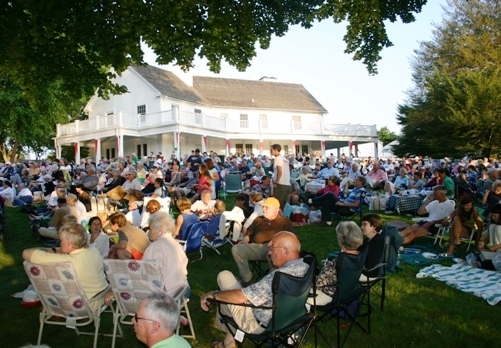 The 2010 “August Nights at Harkness” beneficiaries include The Isaac School, New London High School music scholarship awards, The Yellow Bus Fund of the Lyman Allyn Museum, and Bring Our Music Back, Inc community music initiatives of the organization. Concert tickets are $20 in advance; $25 at the door and ticket packages for both concerts are $37. Children under 12 are free with an adult. All Military are free with ID. Group sales rates are available for 15 or more. To purchase tickets, visit www.bringourmusicback.org, call 860-434-1882 or stop by The Bowerbird or The Hideaway in Old Lyme. This highly anticipated summer event is a town-wide celebration of the arts and takes place this year on Friday and Saturday, July 30 and 31. The two-day community event, a quintessential New England celebration for all ages, is held in the heart of Old Lyme’s historic district. 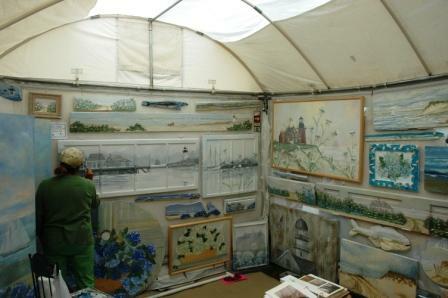 Since the early 20th century Old Lyme has been known to artists and artlovers alike as a haven for the arts. 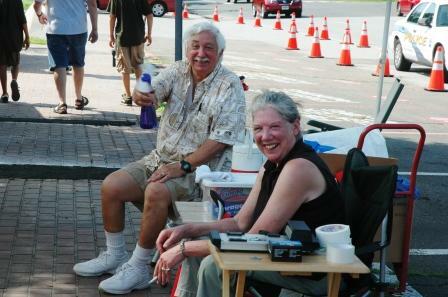 For more than 20 years, the town has showcased its artistic heritage with a Midsummer Festival. This two-day community event, a quintessential New England celebration for all ages, takes place in the heart of Old Lyme’s historic district. The activities span two locations along Lyme Street, the Florence Griswold Museum and the Lyme Art Association. On Friday, July 30, the evening begins with a reception from 5 to 7 p.m. at the Lyme Art Association. Enjoy music, refreshments and two great exhibitions, Marine Art and Anything Goes Art Sale. At the Florence Griswold Museum, visitors enjoy free admission to the special exhibition Connecticut Treasures: Works from Private Collections from 5 to 7 p.m. The annual free concert is always a favorite. This year, Ed Fast and Conga-Bop, known for their Caribbean heart and hard-bop soul, bring island sounds to the banks of the Lieutenant River. Concert-goers are encouraged to bring a picnic dinner or let Dinners at the Farm do the work, see photo below. A delicious, all-local meal served from a vintage “chuckwagon.” Dinners are $25 and kids eat free with an adult meal. Reservations can be made at www.DinnersAtTheFarm.com. Ice cream is also available from the Old Lyme Ice Cream Shoppe. It is the perfect summer evening. On Saturday, the festival continues at 9 a.m. with activities and events at the Florence Griswold Museum. Festival-goers may park at the Florence Griswold Museum, the Lyme Academy College of Fine Arts, Lyme-Old Lyme Middle and High School, and the Old Lyme Marketplace. From 9 a.m. to 3 p.m. a shuttle bus will travel from the Old Lyme Marketplace and schools to the Florence Griswold Museum. One of the highlights of the day is Market En Plein Air. This outdoor market features Connecticut-grown flowers, fruits, vegetables, breads, fine cheeses, herbs and specialty foods in a setting modeled after outdoor markets in French villages. Crafted-by-Hand: An Artisan Fair features noted jewelry designers Billie Beads, Kristen Brown, Jennifer Johnson, and Michaelle Pearson, potter Pat Rist and fabric artist Christelle Lachapelle. These events close at 3 p.m.
Next door to the Museum, at the Lyme Art Association, activities begin at 9 a.m. with art exhibitions and sales. Nationally recognized Marine artists are featured alongside LAA members and offer affordable paintings, drawings, and sculpture. Also at the Lyme Art Association is the Paperback Book Sale: Cheaper by the Dozen, organized by the Friends of the Phoebe Griffin Noyes Library. All books are 50¢ each or 12 for $5. The firemen at the Old Lyme Volunteer Fire Department will be on hand selling their award-winning chili and hot dogs for their annual fundraiser. These events close at 3p.m. 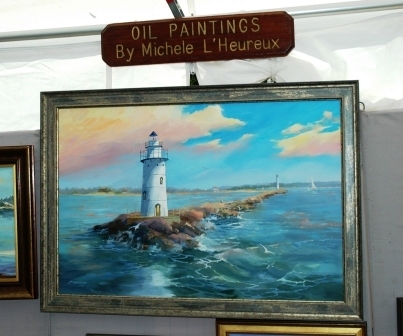 Once again this year, the Lyme Art Association hosts a festival favorite, Artists and Animals, from 10 a.m. to 2 p.m. Using farm animals as models, professional artists work on the lawn to capture their funny farm friends on paper. Bring your drawings supplies and join the fun. At 10 a.m., more events begin at the Museum, including the Hands-On, Minds-On area, where local cultural organizations provide creative projects for all ages. Included are activities by the Old Lyme PGN Library, and Lymes’ Youth Service Bureau, and High Hopes Therapeutic Riding. These events close at 3 p.m. Even four-legged family members can have fun (and win prizes)! Vista Vittles, the 100% natural treats for dogs made by Vista Vocational and Life Skills Center students and members in Westbrook, presents The Parading Paws Dog Contest and Show. Does your dog have the best smile? Longest tail? Biggest paws? Register between 10 and 10:30 a.m. Judging begins at 11 a.m. All dogs must be on leashes. The final parade is immediately following the show. Special categories include Best Trick and Best Costume. From 10 a.m. to noon, award-winning New York Times food writer Kim Severson signs her latest book Spoon Fed: How Eight Cooks Saved My Life. From 1 p.m. to 3 p.m., Wholesome Wave founder, sustainable food pioneer and James Beard Award-winning chef and author Michel Nischan signs his latest book Sustainably Delicious: Making the World a Better Place, One Recipe at a Time. From 10 a.m. to 1 p.m., the Lymes Youth Services Bureau presents the Treehouse Players. The audience becomes part of the plays. From mixed up fairy tales to Dr. Seuss and Free to be You and Me, it’s a guaranteed fun-filled creative experience that will delight the whole family. Drop in at 10 a.m. for storytelling, 11a.m. for theater adventures, and noon for more storytelling. Visitors enjoy reduced admission ($5) to the Museum all day (10 a.m. to 5 p.m.), including the historic Florence Griswold House and the special exhibition Connecticut Treasures: Works from Private Collections. At 7 p.m. the Bee and Thistle Inn and Spa hosts A Midsummer Dinner: Feast, Fairies and Fun, where you can enjoy a scrumptious feast under the light of the moon, complete with strolling minstrels and fairies. Shakespearean dress optional. $75 per person (part of the proceeds benefit the Lyme Art Association). For reservations and information call the Inn at 860-434-1667. Old Saybrook, CT. The Old Saybrook Fire Department will join Governor M. Jodi Rell on Saturday, July 31, in the “Day of Caring & Compassion” by collecting donations of non-perishable food to help replenish Connecticut’s two main food pantries that feed those in need. Old Saybrook volunteer firefighters will be on hand on Saturday, July 31, at fire headquarters at 310 Main St., Old Saybrook from 9 a.m. to 12 noon to accept donations to benefit the Foodshare and Connecticut Food Bank pantries. The Old Saybrook Fire Department, an all-volunteer organization, is one of 12 fire departments across the state to participate in the governor’s Day of Caring & Compassion. Among the items acceptable for drop-off are foods such as: (Sample of non-perishable items): Canned meat, corned beef, spam, 100% Fruit juices: boxes, cans, bottles; powered milk, Pasta & sauce, canned fruit, oatmeal, rice, canned vegetables & beans, breakfast cereal, macaroni and cheese, Regular & low sodium soups and stews. Firefighters cannot collect cash or non-food items as part of the program to help those in need. , Enfield, Fairfield, Middletown, North Windham, Norwich, Waterbury, West Hartford, West Haven, Westport and Willimantic. The Connecticut River Museum’s Family Maritime Festival and Concert, scheduled for Saturday, August 14, will feature maritime games, schooner deck tours, river cruises and an evening concert. Essex, CT – Gather the entire crew and head down to Essex’s historic waterfront on Saturday, August 14 for a boat load of family fun and entertainment. The Connecticut River Museum’s Annual Family Maritime Festival starts at 1 pm with maritime games, songs, and schooner deck tours offered free of charge throughout the afternoon. You can learn how to make rope, caulk a ship, and sing a sea chantey or two. And for those who want to get out on the water, the historic schooner Mary E will set sail at 1:30 pm, 3:30 pm, and 6:00 pm for a leisurely sail along the Connecticut River. Tickets for the 1.5 hour afternoon cruises are $26 for adults and $16 for children age 12 and under. Tickets for the two-hour sunset cruise are $30 per person, all ages. At 5:00 pm, the Connecticut River Museum’s Annual Picnic and Concert gets underway with all invited to bring a blanket or chair and picnic dinner to enjoy while listening to sea chanteys performed by the Freemen of the Sea and folk rock performed by Amalgamated Muck. Wine, beer, and soda will also be available for purchase. A good time for everyone is guaranteed. Festival activities and concert are free of charge. DEEP RIVER— Laura Smith, wife of longtime First Selectman Richard Smith, has been spared jail time on a charge of first degree larceny in the embezzlement of $47,983 from the local Liberty Bank branch. Middlesex Superior Court Judge Patrick Clifford Friday gave Smith, 46, a suspended sentence of eight years in prison. The sentence also includes five years on probation, and a requirement for 225 hours of community service. Smith was arrested last November after a police investigation of the embezzlement of $47,983 from accounts at the Liberty Bank branch on Main Street. Smith had worked as a teller at the bank. The police investigation began in February 2009 after bank officials reported the missing funds. Smith has paid back the embezzleed funds.Police reports in the case indicated Smith had a severe gambling problem, and had lost $408,887 at the Mohegan Sun Casino over the past decade, with about $10,000 in earlier losses at the Foxwoods Resort Casino. Police believe the embezzled funds were used to cover gambling debts. Casinor.com, a Norwegian gambling sites, reports that free spins were offered to Smith due to the frequency at which he attended the casino. The sentence from Clifford also requires Smith to continue to receive counseling for her compulsive gambling problem through a program at Middlesex Hospital, and to stay out of the Mohegan Sun and Foxwoods casinos. Smith, who now works at an area Dunkin Donuts, was also ordered to maintain verifiable employment. DEEP RIVER— The local probate court has appointed the town treasurer as temporary trustee for a charitable Memorial Fund held by the now disbanded Deep River Visiting Nurses. Probate Judge Patricia Damon approved the temporary appointment and ordred the fund frozen for 90 days after a hearing held on July 22. The fund, comprised of charitable donations made to the nurses group over many years, contains about $72,000 held in four accounts at the local Liberty Bank branch. The fund had been controlled by the board of directors of the Deep River Visiting Nurses, which disbanded at the end of June after town voters discontinued funding for the organization in a May 18 referendum. Damon also scheduled a continuation of the court hearing for Oct. 21, where further arguments could be presented for the long-term control of the fund that is intended to provide special assistance to the neediest town residents. Participating in the session on July 22 were Richard Daniels, a former selectman who has been president of the nurses association board of directors, First Selectman Richard Smith, Selectman Arthur Thompson, town attorney Jane Marsh, and Karen Gano, an attorney with the office of the State Attorney General, which frequently monitors the uses of charitable funds. Daniels had requested the probate court hearing. After opening the hearing, Damon asked the participants to meet privately in an effort to reach an agreement on control of the fund. The group emerged after about 75 minutes and then discussed the interim decision with Damon. Smith said Monday he is satisfied with the interim decision on the fund. “We’re working on a policy and procedure for overseeing the fund that will be presented at the hearing in October,” he said. Smith said the current plan is for the board of selectmen to appoint a five-member citizen committee to oversee use of the fund. The committee would include the town’s three representatives to the Visiting Nurses of the Lower Valley Inc. board of directors, and two additional volunteers. The non-profit Centerbrook-based Visiting Nurses of the Lower Valley has begun coordinating services for uninsured and underinsured town residents. Smith said the fund would be used much as it has been, for providing emergency fuel oil/utilities, medical and other assistance to needy Deep River residents. “It would be a one shot deal for people that are having a tough time” he said. Smith said the proposed policy on control and use of the fund would be specified in an ordinance that would be subject to approval of the voters at a town meeting. A few weekends ago, service on Metro-North and Amtrak was thrown into chaos when two trains ripped down portions of the overhead caternary (power line). Trains were cancelled, weekend riders stranded. Metro-North’s service in Connecticut is made all the more challenging by a technological quirk of fate. Ours is the only commuter railroad in the U.S. that operates on three modes of power… AC, DC and diesel. On a typical run from, say, New Haven to Grand Central, the first part of the journey is done “under the wire”, the trains being powered by 13,000 volt AC overhead wires, or catenaries. Around Pelham, in Westchester County, the pantographs are lowered and the conversion is made to 660 volt DC third-rail power for the rest of the trip into New York. Even diesel engines must convert to third-rail, as their smoky exhaust is banned in the Park Avenue tunnels. And there’s the rub: Connecticut trains need both AC and DC, overhead and third-rail, power pick-ups and processors. That means a lot more electronics, and added cost, for each car. While the DC-only new M7 cars running in Westchester cost about $2 million each, the dual-mode M8 car designed for Connecticut will cost considerably more. So, some folks are asking… “Why not just use one power source? Just replace the overhead wires with third-rail and we can buy cheaper cars.” Simple, yes. Smart, no. And here’s why. There’s not enough space to lay a third-rail along each of the four sets of tracks in the existing right of way. All four existing tracks would have to be ripped out and the space between them widened. Every bridge and tunnel would have to be widened, platforms moved and land acquired. Cost? Probably hundreds of millions of dollars, years of construction and service disruptions. Even with third-rail, the CDOT would still be required to provide overhead power lines for Amtrak. That would mean maintaining two power systems at double the cost. We’re currently spending billions just to upgrade the 80-year old catenary, so why then replace it with third-rail? Third-rail AC power requires power substations every few miles, meaning further construction and real estate. The environmental lawsuits alone would kill this idea. DC-powered third rail is less efficient. Trains accelerate much faster using overhead AC voltage, the power source used by the fastest trains in the world… the TGV, Shinkansen, etc. On third-rail speeds are limited to 75 miles an hour vs. 90 mph under the wire. That means, mile for mile, commute time is longer using third rail. Third-rail ices up in bad weather and can get buried in snow, causing short circuits. Overhead wires have problems sometimes, but they are never buried in a blizzard. Third-rail is dangerous to pedestrians and track workers. The idea of conversion to third-rail was studied in the 1980’s by consultants to CDOT. They concluded that, while cumbersome and costly, the current dual-power system is, in the long run, cheaper and more efficient than installing third-rail. This time, the engineers at CDOT got it right. Not satisfied, some of the third-rail fans tried pushing bills through the Legislature in 2005 to study the replacement scheme yet again. More studies would have meant years of delay in ordering already overdue car replacements. Fortunately, the Legislature dispensed with these nuisance proposals quickly. Doubtless, we’ll have further “wires down” problems in the years to come. Ironically, Metro-North’s 97% on-time record has made us come to expect stellar service, despite our ancient infrastructure. But in the long run, service will be faster and even more reliable by sticking with our dual-mode system. Despite temperatures approaching 90 degrees and high humidity, thousands of visitors came to see the arts and crafts on display at the Old Saybrook Arts and Crafts Festival on the Town Green on Main Street today, hosted by The Old Saybrook Chamber of Commerce. The two-day event, sponsored by Liberty Bank, New York Times, Suisman Shapiro Attorneys at Law, ConnectiCare, Essex Savings Bank, Estuary Council of Seniors, Penny Lane Pub and Shore Publishing ran from 10 a.m. to 5 p.m. today and will be open from 10 a.m. to 4 p.m. on Sunday. Admission and parking are free. Nearly 150 fine artisans and crafters will be displaying to over 10,000 visitors. As an added plus, local music groups will be offering entertainment throughout the two days. 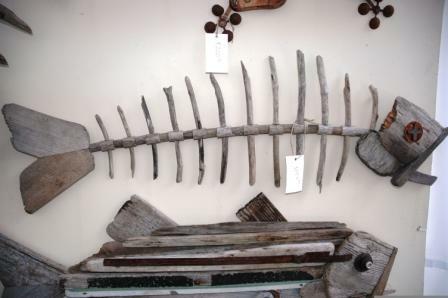 There were art exhibits of every kind including colorful signs (above) and fishes made from driftwood (below), as well as traditional paintings, jewelry and photographic exhibits. Some artists were still finishing their work as visitors arrived! Michele L’Heureux (painting shown above and pictured below) had good reason to look happy as her husband kept them both cool with a combined fan and water spray. Proceeds benefit the multiple programs offered by the Old Saybrook Chamber of Commerce which include college scholarships, business educational breakfast series, after-hours business connection and networking functions, and keynote luncheons with local Connecticut personalities and state dignitaries. The Old Saybrook Chamber of Commerce is a non-profit member organization dedicated to enhancing the economic vitality and quality of life in the greater Old Saybrook area, including the towns commonly known as the Connecticut River Estuary Region – Westbrook, Essex, Clinton, Deep River, Chester, Killingworth, Lyme, Old Lyme and Old Saybrook. Kenneth Gibble, Chairman of Essex Savings Bank announced the election of Directors and Trustees at the Bank’s 159th annual meeting held July 19, at the Bank corporate headquarters in Essex. Incumbents John W. Rafal, Gary H. Reynolds and Richard C. Swan were re-elected to the Board of Directors for a three year term. 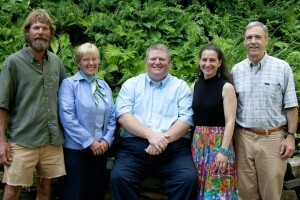 Incumbents Mary Boone, Jeffrey Dunn, Constance O’Brien, Rebekah Renshaw, Mark Richards, Mary Seidner and George Whelen were re-elected as Trustees for a five year term. John W. Rafal, President of Essex Financial Services, said, “Despite a challenging market, assets under management increased by $600 million to $2.7 billion from last year.” Rafal also reported an increase in revenue of 17.4% compared to the previous period. He noted investments in the Madison office, namely its refurbishment and the hiring of five new advisors and two corresponding sales assistants. Chairman Gibble reported that Rafal was ranked the number one Financial Advisor in Connecticut by Barron’s Magazine in their February 22, 2010 issue which ranked the top 30 financial advisors in the state. This was in addition to his previous national ranking of America’s Top Independent Financial Advisers for two years in a row. Essex Savings Bank is a FDIC insured, state chartered, mutual savings bank established in 1851. The Bank has offices in Essex (2), Madison, Old Saybrook and Old Lyme. Essex Financial Services, Inc. is a member of FINRA, SIPC and is a subsidiary of Essex Savings Bank. ESSEX— A three-judge panel of the Connecticut Appellate Court has denied an appeal for the proposed Preserve development on Bokum Road, upholding a 2006 rejection of the project by the Old Saybrook Inland-Wetlands Commission. Essex was a party to the litigation over the project, along with the Town of Old Saybrook, the Connecticut Fund For the Environment, and the Alliance For Sound Area Planning, a grassroots group of opponents. While plans for development of the 1,000-acre parcel on the north side of Bokum Road have been under discussion for a decade, the latest application from River Sound Development called for a 221-unit housing complex with an 18-hole golf course. The Old Saybrook Inland-Wetlands Commission denied permits for the project in 2006, and an appeal of the denial filed by River Sound had been rejected by superior Court Judge Julie Aurigemma in February 2008. River Sound Development is a subsidiary of Lehman Brothers Holdings, which declared bankruptcy last year. The prospective developers now have 20 days to file a further appeal with the Connecticut Supreme Court. Most of the forest land proposed for development was in Old Saybrook, but 65 acres were in Essex. The main access to the proposed development would have been from Bokum Road, just east of the Essex town line. First Selectman Phil Miller said Thursday he is pleased with the outcome, and remains hopeful the large tract could eventually be acquired by various parties for preservation as open space. The parcel contains about 114 acres of wetlands. Miller said environmental issues raised by opponents, including the presence of large numbers of wood frogs on the property, appears to have been a factor in the panel’s decision. Essex had obtained intevenor status to the proceedings, and had retained the law firm of Shipman & Goodman to represent the town’s interests in the process. The Ivoryton Playhouse continues the tradition of Friday morning Children’s shows with some familiar stories and some new. July 23rd: Madhatters Children’s Theatre presents Robin Hood: An adaptation of the classic story of robbing the poor to give to the rich. July 30th: Crabgrass Puppet Theatre presents Jabberwocky. Explore the magical world of Lewis Carroll’s Alice Through the Looking Glass, where you’ll meet wondrous creatures like the mimsy borogrove, the frumious bandersnatch, and the dreaded Jabberwock! August 13th: Goowins Balloowins: Madcap balloon artist, Allynn Gooen, invites audience members into his stories as they become the actors, while he creates their sets, props, and costumes and other crazy objects from balloons. August 20th: The Ivoryton Playhouse Interns present The Bully Goats Griff. Children will delight in this light-hearted, funny show. All performances are at 11am and all tickets are $12. There will be an additional 1pm show of Robin Hood and The Three Bully Goats Griff. Customers can now access 9TT’s self-service site at www.9towntransit.com. Each customer is provided a login ID and password. Trip bookings are immediately confirmed, with no need to speak to a reservation agent. Customers will also have the ability to view future trips and make cancellations. In addition, they can see estimated pick up times for the current days trips based on real-time performance data. The new self-service site will provide a new option for customers to book trips 24 hours a day, 7 days a week. It also allows customers to easily confirm trips and view estimated pick-up times without having to call a reservationist, eliminating phone wait times. Do you want to raise a puppy with a purpose? Guiding Eyes for the Blind is now accepting Puppy Raiser applications for those interested in raising a potential guide dog! All guide dogs start in the heart and home of our puppy raisers, where they learn obedience, good house manners and socialization through the hard work of our dedicated volunteers. The “Summer Delights” exhibition will feature three shoreline artists – Judith Chapman and Anne Holmes of Old Lyme and Peggy Traskos of Mystic – at the Old Lyme Phoebe Griffin Noyes Library from July 23 through September 10. The exhibition will open with a public reception for the artists on Friday, July 23, from 5 to 7 p.m. Works are for sale, with the artists donating a portion of the proceeds to the library. This is the third exhibition this year showcasing contemporary artists, following a tradition that dates to 1902 when the library became the first gallery in Old Lyme, to feature the work of the early American Impressionists who formed the noted art colony here, according to Mary Fiorelli, PGN director. In “Summer Delights” the three artists who work in pastel and oil, bring an enticing and broad range of subject matter – still life, frolicking animals, plein air-painted landscapes and distant ports of call. Judith Chapman, a Connecticut native, has lived also in California and Vermont, where she continues to spend part of the year. “The people, land, and the experience of living in Vermont have been and continue to be an important influence on my life and art,” she says. 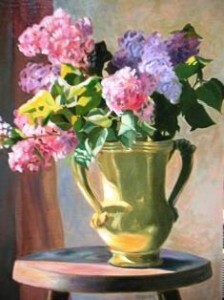 She describes herself as a representational artist who enjoys painting diverse subject matter, experimenting with different approaches to painting – “to keep my art life exciting and growing.” Her work, “Gold Vase” in pastel is pictured left. Having painted primarily in oil, she recently decided to study pastel. “I think learning pastel techniques has helped me see that I can use color in new and better ways,” she explained. A fine portraitist as well, she employs an approach quite different from the typical posed portrait. Chapman earned a BFA from Hartford Art School when it was located at the Wadsworth Atheneum, a “unique place to attend art school,” she found. She has also studied with a number of noted California and Connecticut teachers and taken workshops with The Plein Air Painters of America. She is an elected artist member of the Lyme Art Association (LAA) where she has served on the board of directors. Her work has been exhibited at the LAA as well as at the Cooley Gallery, the Garvin Gallery (formerly in Essex), The Art Gallery at the Mill House, Chester, Gallery On Main, Niantic, and the Erickson-Davis Gallery, Ivoryton. Her work is in many private collections throughout the country. In 2004 she was one of the first group of artists invited to paint palettes for the Florence Griswold Museum’s “Miss Florence’s Christmas Tree.” The palettes are part of the museum’s permanent collection. Anne Holmes brings an international flair to the exhibition. Born in Switzerland, she became a flight attendant for TWA, traveling throughout the world from her bases in Paris and Rome. Several oil paintings capture scenes of her native country and of the charming historic port in Quiberon, France. Although she was always interested in art, she did not begin painting until 1997, when she took classes at the Lyman Allyn Art Museum in New London. She has continued studies privately and with instructors at the Lyme Art Association. She enjoys plein air painting and has participated in workshops with The Plein Air Painters of America. Her work has been exhibited in juried shows at the Lyme Art Association, where she is an associate member; at the Essex Art Association, Mystic Art Center and in Pont de Vaux, France. Her paintings are in private collections in the United States, Switzerland and France. A resident of Old Lyme since 1991, she now divides her time between Connecticut and Florida. 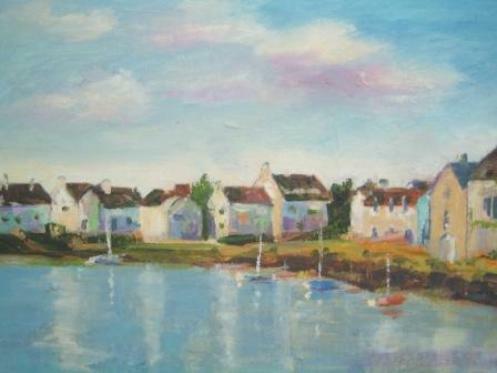 "On the Port in Quiberon" by Ann Holmes is one of the paintings featured in the "Summer Delights" exhibition. Peggy Traskos lived in Brooklyn, Conn., for 35 years before moving to Mystic. She has a BS degree in education from Willimantic State College and has taken graduate courses in library information services at the University of Rhode Island. She was an elementary school teacher and later while a part-time library teacher, she continued to take art classes, working on perspective and sill life set-ups. She had a long-time interest and love of pastel but it was while studying at the Lyman Allyn Museum that “the art bug really bit,” she said. She enjoys the light and atmosphere of plein air scenes, but has also concentrated on animals – what she calls her “in-door paintings,” working from her husband’s photographs. “I love the expressions or stances of different cows, goats, sheep and horses and I try to give them a connection to the viewer,” she said. 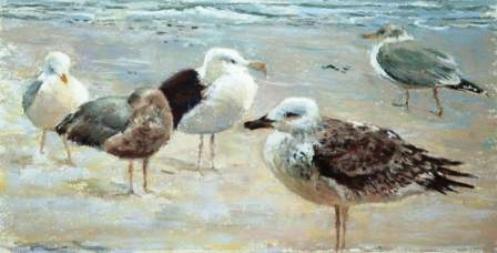 She has an uncanny ability to capture the “personalities” of shore birds, as in “The Gulls” or “Frolicking Goats” or a young colt in a pasture, with the feeling that they were painted en plein air. "The Gulls" by Peggy Traskos is typical of the artists's work. The Old Lyme Phoebe Griffin Noyes Library is located at 2 Library Lane, Old Lyme. Hours are Monday and Wednesday, 10 a.m. to 7 p.m.; Tuesday and Thursday 10 a.m. to 6 p.m.; Friday, 10 a.m. to 5 p.m. and Saturday, 10 a.m. to 2 p.m.
Old Saybrook, CT – DATE- The Old Saybrook Chamber of Commerce is honored to host the 47th Annual Liberty Bank- Old Saybrook Arts and Crafts Festival, July 24 and 25, 2010. 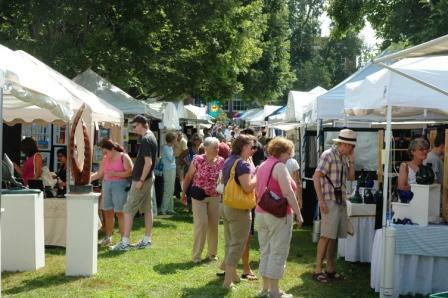 The juried festival has grown over the years to include many accomplished artisans and crafters. The two-day event, sponsored by Liberty Bank, New York Times, Suisman Shapiro Attorneys at Law, ConnectiCare, Essex Savings Bank, Estuary Council of Seniors, Penny Lane Pub and Shore Publishing, will be held on Old Saybrook’s beautiful Town Green on Main Street from 10am-5pm on Saturday and 10am-4pm on Sunday. Admission and parking are free. 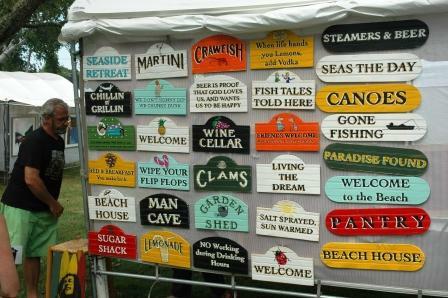 Nearly 150 fine artisans & crafters will be displaying to over 10,000 visitors. As an added plus, local music groups will be offering entertainment throughout the two days. A community art tent will be available for children and families to decorate unique fabric squares, which will be made into quilts by St. John’s Piecemakers and donated to charity. A variety of foods to please every age and palate is also on hand, hosted by local civic organizations. The Chamber is a non-profit member organization dedicated to enhancing the economic vitality and quality of life in the greater Old Saybrook area, including the towns commonly known as the Connecticut River Estuary Region – Westbrook, Essex, Clinton, Deep River, Chester, Killingworth, Lyme, Old Lyme and Old Saybrook. Through a core of volunteers and a professional staff, the Chamber provides leadership, support, and networking within the business community. The Chamber hosts community events and serves as a catalyst to promote tourism, to support educational outreach and to act as an information source. For the first time in 43 years, YMCA of the USA has unveiled a new brand strategy to increase understanding of the impact that YMCAs make in communities across the country. The YMCA has the unique capacity to address many of the challenges facing the nation today. Through its new brand strategy and framework, the nonprofit will extend its reach into communities to nurture the potential of youth and teens, improve the nation’s health and well-being and provide opportunities to support neighbors. The new brand strategy – the result of more than two years of analysis and research – was introduced today at a National Press Club event that included leaders from the philanthropic and nonprofit communities. As part of the event, the YMCA unveiled a new, more forward-looking logo that reflects the vibrancy and diversity of the organization, and a framework that focuses resources on three core areas: youth development, healthy living and social responsibility. In another major change, the nonprofit will be called “the Y” to align with how people most commonly refer to the organization. The community can expect from the VSY’ a newly renovated gymnasium coming this August in perfect timing to compliment their new branding and newly renovated facility. Ys across the country will fully transition to the new brand within five years. The Y’s former logo had been in place since 1967 and was the organization’s sixth since its inception. The refreshed logo, with its multiple color options and new, contemporary look, better reflects the vibrancy of the Y and the diversity of the communities it serves. The new logo’s bold, active and welcoming shape symbolizes the Y’s commitment to personal and social progress. The Y is one of the nation’s leading nonprofits strengthening communities through youth development, healthy living and social responsibility. Across the U.S., 2,687 Ys engage 21 million men, women and children – regardless of age, income or background – to nurture the potential of children and teens, improve the nation’s health and well-being, and provide opportunities to give back and support neighbors. Anchored in more than 10,000 communities, the Y has the long-standing relationships and physical presence not just to promise, but to deliver, lasting personal and social change. For more information contact the Y at 860-399-9622 or visit us on the web at www.vsymca.org. Lee White is a resident of Old Lyme in a section of town where she and her house are the oldest members. She has been writing about restaurants and cooking since 1976 and has been extensively published in the Worcester (Mass.) Magazine, The Day, Norwich Bulletin, and Hartford Courant. She currently writes Nibbles and a cooking column called A La Carte for the Times and Shore Publishing newspapers, and Elan, a quarterly magazine, all of which are now owned by The Day. I wasn’t sure that Jack Flaw would reopen Jack’s at Harbor One Marina, since his two Jack Rabbit’s, one on Main Street in Old Saybrook, and the other in Storrs, to say nothing of the ones he plans on opening, first in Burlington, Vermont. But I saw his pickup at the Old Saybrook Marina and decided to stop. I always with Jack, he said of course the hot dog emporium would be open. It is open each day during the summer. It serves lots of egg sandwiches (one made with Spam—we may think Spam is silly, but Hawaii loves Spam and uses more than any other place in the world). And his dogs are amazingly delicious and most seem new and different. I pine for the Symba dog—chipotle ketchup and grilled mac and cheese—which I will try soon. I was also happy that his Doug Dog is still on the menu—my husband loved the sweet potato mustard, chili and hot slaw. I think I will have to get that one, too. The Carolyn Greenleaf Fund is accepting applications for a music scholarship for talented high school students. 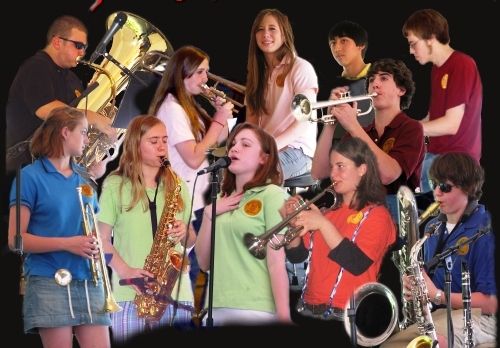 The scholarship was established at Middlesex County Community Foundation in 2007 to honor the memory of Carolyn Greenleaf, a resident of Essex who was passionate about music education and who worked tirelessly to promote music in our communities. The award is made twice each school year for a 17 week session of 30 minute private lessons at an institution of the recipient’s choice. The scholarship is not renewable, and can only be won once by an individual. The scholarship is based on merit, not financial need, and is open to residents of Middlesex County and to students residing in Old Lyme and East Lyme. The deadline for application for the Fall 2010 semester is 4:00 p.m. on Friday, August 27, 2010 . Applications may be obtained by visiting Middlesex County Community Foundation’s website at www.MiddlesexCountyCF.org Completed applications should be sent to: The Carolyn Greenleaf Fund c/o Patricia Hurley 15 Main Street, Ivoryton, CT 06442 Questions may be directed to Ms. Hurley at 860-767-9725. The Middlesex County Community Foundation is a nonprofit organization dedicated to improving the quality of life in Middlesex County. Its two-fold mission is: (1) to work with charitably-minded individuals and organizations to build permanent endowments and other charitable funds and (2) to support local nonprofit organizations through effective grant making to address community needs. Since its founding in 1997, the Community Foundation has provided more than $1.5 million in grants to more than 200 organizations for the arts, cultural and heritage programs, educational activities, environmental improvements, and for health and human services. For more information call 860-347-0025, email info@MiddlesexCountyCF.org or visit the website: www.MiddlesexCountyCF.org. Young Adults and their Parents are invited to the Essex Library on Tuesday, July 27 at 6:30pm for a “Off to College: A Workshop for Students and Parents” Presented by Karen Goldfinger, Ph.D. and her daughter Jessie Tijl. The workshop will feature Tips for choosing a major, getting good grades, and having a great time. Dr. Goldfinger is a psychologist in Essex with an interest in helping young adults succeed. She conducts career and educational assessments for teenagers and young adults, and she is a parent and former Essex School Board member. She is also the lead author of a textbook, Psychological Assessment and Report Writing (Sage, 2010). Jessie Tijl is entering her senior year at Occidental College in Los Angeles. She is a pre-med student majoring in Biology and minoring in Urban and Environmental Policy. She recently returned from a study abroad semester in Costa Rica and a brief stint as a volunteer at a medical clinic in Peru. She has learned how to succeed in college while having a great time, and she is ready to offer some tips to incoming freshman. Please contact the Essex Library at 767-1560 or jmccann@essexlib.org to register for this important informational evening. REGION 4— The Region 4 Board of Education has selected Eric Rice of Chester as the new principal for Valley Regional High School while also approving new hires for associate principal at John Winthrop Middle School and director of food services for the full Chester-Deep River-Essex school district. Rice currently serves as principal for the University High School of Science and Engineering, a magnet school for the Hartford public school system. Rice replaces Ian Neviaser, who has served as principal at the high school for the past two years. Nevaiser was selected last month as the new assistant superiuntendent for Region 4. Rice has a Bachelor of Science in civil engineering from the University of Connecticut, along with a Master of Arts degree in middle school education from Southern Connecticut State University, a sixth year certificate in educational leadership from Sacred Heart University in Bridgeport, and certification as a physics teacher.He has worked as a physics and engineering teacher, a science department coordinator, and as an adjunct professor at the Central Connecticut State University School of Engineering and Technology Education. The school board also selected Peter Foxen as the new associate principal at John Winthrop Middle School. A Rocky Hill resident who is married with three children, Foxen has worked in the Portland school system for the past decade, teaching social studies and language arts at the middle school. He has also served as a team leader, and director of Portland’s after school and summer school programs. Foxen, who worked as a banker before transferring to education, holds a Bachelor of Arts Degree in history from Hartwick College, a Masters degree in education from St. Joseph’s College, and an administrators certificate from Sacred Heart University. He also begins working at Region 4 next month. Thomas Peterlik of Deep River has been selected as the new director of food services for the school district. A native of Austria, Peterlik holds a degree in culinary arts from the Culinary Institute of Austria and a degree in food and beverage management from Cornell University in New York. He has worked as general manager of food services at Yale University for the past decade, and has prior experience as a chef for hotels and cruise ships. Levy said Peterlik has experience in management and budgeting, and “has a strong interest in working with the local farming community to provide healthy, nutritious, and exciting meals for students in our district.” Peterlik will direct food services at the high school and middle school, along with the elementary schools of Chester, Deep River, and Essex. The Old Saybrook Fire Department will participate on Saturday, July 31, in Governor M. Jodi Rell’s “Day of Caring & Compassion” by collecting donations of non-perishable food to help replenish Connecticut’s two main food pantries that help those in need. Old Saybrook volunteer firefighters will be on hand at fire headquarters at 310 Main St., Old Saybrook, from 9 a.m. to 12 noon to accept donations to benefit the Foodshare and Connecticut Food Bank pantries. The Old Saybrook Fire Department, an all-volunteer organization, is one of 12 fire departments across the state to participate in the governor’s Day of Caring & Compassion. Among the items acceptable for drop-off are foods like pasta, canned goods, peanut butter and other non-perishable items such as canned meat,corned beef, spam, 100% fruit juices, boxes, cans, bottles of powdered milk, pasta and sauce, canned fruit, oatmeal, rice, peanut butter, canned vegetables, breakfast cereal, macaroni and cheese, regular and low sodium soups and stews, boxed rice and canned beans. Other fire departments participating in the July 31 event include Danbury, Enfield, Fairfield, Middletown, North Windham, Norwich, Torrington, Vernon, Waterbury, West Hartford, West Haven, Westport and Willimantic. VetsFest is being held next Saturday from noon to 10 p.m. at the Martin Bishop (Fireman’s) field at 91 Long Hill Rd. in Guilford. A great line-up of bands is scheduled and there will also be a raffle with some wonderful prizes. Between noon and 4 p.m., the event will be “family-centric” and include Touch-a-Truck, an ambulance and a genuine race car. All proceeds from the event will go towards constructing a new building for the Guilford VFW. The existing VFW Building is in very poor condition. The rental of the existing building serves as the primary source of revenue to pay utility bills, and fund in and out of town community projects involving veterans and others in need. Three years ago, the two boilers providing heat to the building were on their last legs. VFW Hall Commander Larry Santamaria asked for the assistance of Stephen Spurrell of Neighborhood Builders, Inc (NBI) of Guilford. Further inspection uncovered many leaks, rotting wood, and no building insulation. Local architects, a structural engineer, and land surveyor have already donated their services. NBI will complete all of the plan development and construction management, at no cost. A plan is in place along with Town approvals from Planning & Zoning, Zoning Board of Appeals, and Wetlands to build a post and beam style structure, including state of the art equipment, on substantially the same footprint. Click here for more information and a full line-up of bands. Lyme-Old Lyme Win 10-11 Year Old District Championship! 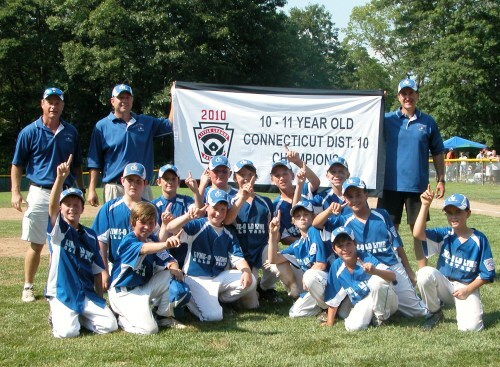 Despite finding themselves 6-0 down, the Lyme-Old Lyme Little League 10-11 All-Stars bounced back yesterday afternoon to defeat Waterford South 12-7 and win the District championship. The team dedicated their game to their classmate, 12-year-old Caroline O’Brien of Old Lyme, who is battling a rare form of brain cancer. Jonathan Rapp’s River Tavern in Chester, a town that must indeed be Brigadoon—you remember Brigadoon, that special little town that only existed if you were actually there—has brought some of its best lunch dishes to the Florence Griswold Museum for the summer and through early fall of 2010. Appetizers you can share include guacamole with homemade tortilla chips and hummus with pine nuts, spices, lemon and chilies. I myself pine for Caesar salad (the best! ), grilled summer veggies, Moroccan spiced chicken with chickpeas, raisins, almonds and yogurt dressing and Thai-style Stonington seafood. Perhaps it’s a lobster salad or pulled pork sandwiches you’re in the mood for, or your children want hot dogs with chips or PB & J. Finish with berry shortcake with whipped cream. Everything is locally grown and fresh, fresh, fresh. The goat cheese is from Beltane Farm and the cow-milk cheese hails from Cato Corner in Colchester. Scott’s Orchard, Four Mile River Farm and White Gate are just a few of the other purveyors. The ambience is gorgeous and—like Brigadoon—as long as you’re there, so will be summer. Mariette Brown is an office manager at a law firm, a sculptor and a watercolor painter. She lived in Old Lyme for 18 years, and three years ago moved to Old Saybrook, where she lives on a hill with her husband, two dogs, two cats, 4,357 voles and approximately 90,000 bees. The daughter of our founding publisher, Jack Turner, she loves the woods, the ocean, rivers, clouds, animals, plants, bugs, chocolate and good French bread. In short, she loves the world. (She can take or leave humans as a species, but does enjoy a few individuals.) At this point, to her, almost everything has environmental ramifications. The recent sudden summer storms bring home a situation I encountered this past February. I had recently returned from a trip to El Salvador, which—in my quest for eternal youth—I took with our teen group from the First Congregational Church of Old Lyme. We were there near the end of the dry season, and while it was dry and dusty, available water was not an issue. It came gushing from the hose to water the lawn where we stayed, and to fill our pool. It was spread on the roads to keep down the dust. It was freely available from the relatively high water table on the coastal plain where we were working. The plants in peoples’ gardens were lush, even in this dry season. Only 25% of the population of El Salvador has safe drinking water, even though a lot of the country gets 6 feet of rain a year, mostly falling w/in their six-month rainy season. Contrast that to here in Connecticut, where we get an average annual rainfall of 3.5 feet a year, and you get a sense of how soggy it must get. The results of flooding showed in the washed-out bridges, the years-old detours around homes to a shallow place where a makeshift bridge serves one-way traffic. Perpetual guards were stationed before the old bridges, to make sure no one mistook the roads as complete. They had nice little set-ups, seats of overturned buckets, umbrellas for shade, a flashlight for night-time. But everyone knew. It had been that way for so long. The water, abundant from the tap, the toilets, the showers, the pools, was a disaster to get in your mouth. The group we worked with supplied water for our drinking (and toothbrushing, food rinsing, dishwashing – the list grew as we thought about the problem – and as more and more of us came down with some mysterious malady…) provided in ubiquitous five-gallon blue water bottles. We saw enormous trucks of blue water bottles out for delivery in San Salvador. Some places had rows and rows of bottles lined up outside their doors. We also saw trucks pumping water from the river – for what, I don’t want to know. To fill our blue bottles? Conveniently, waiting at home for me on my return was the new issue of National Geographic—devoted to water. Polluted water for much of the world is not just an inconvenience, it’s a fact of life. In many countries around the world, people just cannot afford to buy those blue bottles of clean water. Dirty water causes many illnesses, resulting in time lost from school, from work, medical expenses and many times, death. The solutions all sound so simple—dig a well, or dig a deeper well, right? Many NGOs and charitable aid groups are working hard on exactly this sort of thing. All too often, though, aid groups come in and provide the materials for clean wells and water in a particular region, but fail to provide for maintenance. Everything works fabulously until something breaks, and then the community doesn’t have the knowledge or the finances to fix the pump, the leak, whatever. Fortunately this is changing. Aid organizations are now training and supporting people in establishing governing boards to manage their communal resource, teaching them to repair the equipment and to establish a budget for maintenance. As the water improves, so do the lives it affects. Less time is spent down and out from illness, away from school or work. Incomes go up, kids manage to finish school, and less time is spent on the very act of obtaining water, freeing people (usually women and girls) up to do the rest of living. Barbara Kingsolver wrote one of the essays in the water issue of National Geographic, and closed with this astute observation: While we may depend on water, all the harm we do to it we do to ourselves. We need water. But water does not need us. It will carry on, with or without us. Frost’s lines concern a stand of birches observed in winter, bent down, as those trees tend to be, by snow and ice. It is as if, Frost observes, a small boy had shinnied up the trunk, and, with the bravado of the young, reached the end of the tree, and flung himself, clutching its topmost branches, feet-first into the blue winter sky and “ridden” the tree to the ground. Now given the fact that it’s July in New England, as opposed to January, I will make bold to offer a seasonal amendment to Mr. Frost and note that, fine as birches are, one could also do worse than be a sitter of porches. Bear with me, and I may actually get you to believe that homely, un-“hot” objects like birches and porches can actually be the stuff of meaning, allowing us to revel in life rather than merely regarding it as a conquerable commodity or something to be endured. Porches are ephemera to many modern home builders and largely to the 21st century mindset in which everything seems to require justification via a specific purpose. Real porches–and here I exclude so-called “three-season rooms” which are made practicable, and therefore justifiable, by insulation or infomercial awnings; and “decks” which many times dangle in space supported only by four by fours and which function as a grilling stations and occasionally collapse, sending bratwurst, steaks and grill person into the sump-pump bog some 18 feet below—are, like summer, short-lived, sloth-inducing, and community-inviting. And to have one, especially a front porch, is to be blessed. First, porches represent the once-upon-a-time in architecture. A time when folks strolled streets after dinner; a time when neighbors knew their community as faces and names met over day-to-day dealings; a time when social interaction was spontaneous rather than marked on an agenda three weeks in advance. So once upon a time, after supper, you spied Fred and Mabel over your flower boxes and invited them up to your porch for ice cream and/or gossip. Porch furniture, likewise, embodies a largely abandoned approach to existence: It does not warm, vibrate or advertise as orthopedically approved. Rather, it rocks, but back-and-forth; it swings, but in the wind. So once upon a time, Junior de-camped to the porch and poured over Treasure Island, or Pop left the edging until tomorrow and expended his strength willing Ted Williams to first base while downing a lemonade. As I said, one could do worse than be a sitter of porches. AREAWIDE— The two rivals for the Democratic judge of probate nomination in the new nine-town diostrict are self-funding their campaigns, at least as far as the campaign finance reports filed this week for a period ending July 10. Terrance Lomme, an Essex lawyer, and Raymond Rigat, the three-term incumbent judge of probate in Clinton, are competing in an Aug. 10 primary in the district that includes the towns of Chester, Clinton, Deep River, Essex, Haddam, Killingworth, Lyme, Old Saybrook, and Westbrook. Lomme won the party endorsement over an initial field of six candidates at the May 11 nominating convention. The primary winner will face Republican nominee Anselmo Delia, a Clinton lawyer, in the Nov. 2 election. According to finance reports for the period ending July 10, Lomme has accepted no donations and funded his campaign with personal donations totalling $12,320. Rigat has funded his campaign with personal donations totalling $6,732. Lomme has expended about $7,000 for three roadside billboards, including one on Route 154 in Deep River. Lomme has also expended $5,000 for campaign assistance from the Glastonbury public relations firm of Cashman & Katz. The firm had also assisted Essex Judge of Probate Deborah Pearl, a Republican, in 2006 when she was challenged for re-election by local attorney James Carey. Rigat has expended about $3,740 on postage for a recent campaign mailing to all registered Democrats in the district, and $1,166 to Technique Printers of Clinton for campaign materials. The new judge of probate takes office for a four-year term in January at a regional probate court to be located in Old Saybrook. The consolidation of local probate courts in to regional probate districts was required under legislation approved by the General Assembly. Deep River voters opposed expansion of the town’s firehouse in a close vote in a referendum today, 13 July, 2010, 347 voters opposed the project, with 312 voting yes. DEEP RIVER— The local probate court hearing on the status of a memorial fund held by the now disbanded Deep River Visiting Nurses has been postponed until July 22. The hearing at the court of Local Probate Judge Patricia Damon had been scheduled for Tuesday. First Selectman Richard Smith said the hearing was rescheduled after the office of the state Attorney General announced it would send a staff attorney to participate in the session. Daniels asked the Probate Court to appoint a trustee to ensure that future expenditures from the fund are consistent with the current use, which is providing charitable assistance to needy Deep River residents. Daniels advised the fund has been used in recent years to help pay for fuel oil, prescrition medications and eyeware, clothing, rental assistance, and payment for elctricity and other utilities for needy town residents. The fund, in four separate accounts at the local Liberty Bank branch, contains about $72,000. The largest donations to the fund were received over the past two years, including about $55,000 from the estate of C. Talcott Scovill, and about $18,000 from the estate of Elsa Potter. Smith said he believes the board of selectmen’s goal for the fund is similar to the use proposed by Daniels, as a separate fund to provide special assistance to needy Deep River residents. Smith has suggested the board of selectmen could appoint a volunteer citizen committee to guide the use of the fund. Five longtime Chester residents will be honored at a town-wide picnic at 4:30 p.m., on Sunday, August 8, for their contributions to the community’s quality of life. Debra Calamari: town clerk, volunteer for the women’s auxiliary of the Chester Hose Company, the Chester Historical Society and other organizations. Rick Holloway: longtime member of the Chester Conservation Commission, Wetlands Commission, Chester Land Trust, and also on boards for the Robbie Collomore concert series, Camp Hazen, and the United Church of Chester. Meg Gister: music teacher at Chester Elementary School who has introduced the joy of music to hundreds of children and greatly expanded the school’s band. Meg is also choir director at Congregation Beth Shalom Rodfe Zedek. Mike Rutty: secretary and player representative of the Chester Little League, Cub Scout master and organizer of many of the Scouts’ community projects and former trustee of United Church of Chester. Leif Nilsson, chair of the Chester Merchants Associations, artist whose work features local scenes, gallery owner, and perpetual promoter of Chester’s great assets. The picnic and award ceremony will feature music by Liquid Groove, comprised of Chester performers Chris Devlin Brown, Justin Good, Hans Lohse, and Rich Tortorigi. Attendees are invited to bring their own picnic dinners, a dish to share for the community table and there will be access to a grill provided by the Chester Hose Company. The Chester Pillars committee is composed of representatives from several sponsoring organizations, including Chester Rotary, Land Trust, Historical Society, Library, Town Hall, Hose Company, St. Joseph Roman Catholic Church, United Church of Chester and Congregation Beth Shalom Rodfe Zedek. ESSEX–The town is about to hire a new zoning enforcement officer, filling a key position that has been vacant since the departure of Marian Staye from the job in early May. Selectman Joel Marzi said Friday a selection committee completed interviews with three finalists Thursday evening, and has selected a candidate for final approval by the board of selectmen. Marzi said the recommended individual is undergoing a required backround check that should be completed within a week. Staye, a Deep River resident, left the job in early May after nearly eight years in the position. The job also includes administrative and enforcement duties for the inland-wetlands com mission. A total of 12 individuals initially applied for the position. Along with Marzi, the selection committee was comprised of Zoning Commission Chairman Alvin Wolfgram, zoning commission member Susan Uihlein, Inland-Wetlands Commission Chairman Daniel Lapman, and IWC alternate Fred Szufnarowski. Marzi said Staye, who has been working at least one day a week in the job since her departure, also participated in the interviews. Marzi said he would suggest the board of selectmen hold a special meeting to meet with the recommended candidate and make a final hiring decision. The new zoning/inland-wetlands enforcement officer should be on the job by the end of this month or early in August. Endorsed Democratic gubernatorial candidate Dan Malloy has been invited to join other Democratic state candidates at a family-style Meet-the-Candidates rally on July 24th, in Old Saybrook. The event, sponsored by Democratic town committees of Old Saybrook, Essex, Old Lyme, and Chester, and others, is billed as a chance for voters and their families to meet and talk with their candidates before the Democratic primary on August 10th. The rally will be held at Clark’s Field, across from Past Vita on Elm Street, between 4 and 6 p.m. Admission and food will be free, and there will be some activities for children. For further information, call Lee Rowley at 860-304-6956. Dogs, Cats, Birds, Fish, Horses, even Llamas and Ferrets, any one of hundreds of companions could be the first annual mascot of the Middlesex County Community Foundation’s “ARF! Animals: Respect and Friendship” Fund. In 2008, a Middlesex County family of animal lovers established ARF! Animals: Respect and Friendship, an endowed, community based Fund dedicated to helping animals and their human friends in Middlesex County. This family believes that we have a strong responsibility and obligation to preserve the basic dignity that comes with sharing the world with all living creatures. They also believe that pets, in particular, provide unqualified love, true companionship and, in some cases, essential services to the disabled, elderly and those in need. The Fund aids local nonprofit organizations that care for animals and funds such things as shelter and comfort; training animals and people for shared gifts of companionship; therapy and assistance; rescue, protection and adoption; prevention of cruelty; and services to the disabled. The winner of the ARF! contest will be featured in Community Foundation newsletters, brochures, the annual report, the website and other informational venues. The mascot will also be featured in “ARF!” notes about educational events and programs, featured stories, animal-related tips, and other items throughout the year. Prizes will be given in other categories as well, including “Top Dog,” “Purrfect Feline,” “Largest Companion (Pet),” and “Oldest Friend.” Further details about contest requirements and submissions may be found at www.MiddlesexCountyCF.org, e-mailing questions to Info@MiddlesexCountyCF.org, or calling 860.347.0025. MCCF is accepting story submissions from Middlesex County residents Friday, July 9, 2010 through Wednesday, August 4, 2010. Stories should be no longer than one page in length and may be accompanied by up to two photographs. Submissions can be e-mailed to Info@MiddlesexCountyCF.org or mailed to Middlesex County Community Foundation, 211 South Main Street, Middletown, Connecticut 06457. All stories and photos submitted may be used by MCCF in newsletters, e-news updates, reports, website pages and other marketing and public relations venues. The Valley-Shore YMCA will be hosting a free dinner and movie night for the community this summer at their location on 201 Spencer Plains Road in Westbrook on July 16th starting at 7:00 p.m.
A family film will be played on a large screen theater by the Pavilion of the YMCA for that good old outdoor summer family feel. This summer experience will be FREE to the community. Dinner will include grilled food, refreshments, popcorn and other snacks. mentions Paul Mohabir, CEO of the Valley-Shore YMCA.